On 27th January, the event, hosted by Prime Minister of Pakistan, launched Volume I of the ‘Powering Pakistan for the 21st Century’ report by “Pakistan Alliance for Math & Science”. 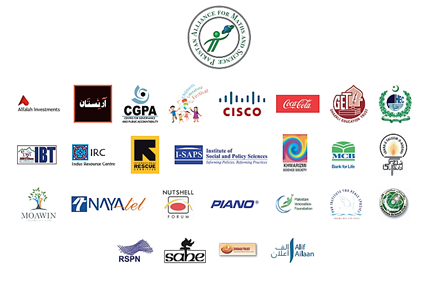 Idara-e-Taleem-o-Agahi is a proud member of this alliance. Volume I is titled, “How Maths and Science Powers Nations” and presents the case for maths and science education as being essential to progress and prosperity of all nations. The event was attended by ministers, eminent scientists, members of academia and researchers from around Pakistan, as well as leading companies and businesses. 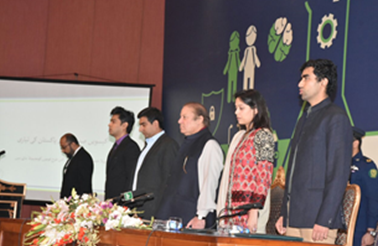 “Maths and science education is the guarantor of a bright future for Pakistan,” said Prime Minister Nawaz Sharif, at an event he hosted along with the Pakistan Alliance for Maths and Science (PAMS), an informal collective of leading businesses and non-profit organisations dedicated to ensuring greater attention for Maths and science education in government schools across the country. Speaking at the launch, PM Sharif admitted that Maths and Science education has not received adequate attention by previous governments and spoke about the urgency for the preparation of the Fourth Industrial Revolution, mentioning recent meetings with Chairman Microsoft Bill Gates and CEO of Ali Baba Jack Ma at the World Economic Forum. He said, he envisions a Pakistan that secures a future for young Pakistanis in which they are not just job-seekers, but inventors, entrepreneurs, enablers, disruptors, researchers, and global market leaders. Further, he emphasized that his presence represents the vision of his government for a better and brighter Pakistan that occupies a prominent position amongst the comity of nations. DrBaela Raza Jamil, CEO – Idara-e-Taleem-o-Agahi (Alliance Member – Pakistan Alliance for Maths& Science), said, “It is praiseworthy that leading political figures are endorsing the urgency of Maths and Science education for Pakistan,” and expressed hope that this ownership will extend to the provinces and be reflected in classrooms in all publicly-funded schools. 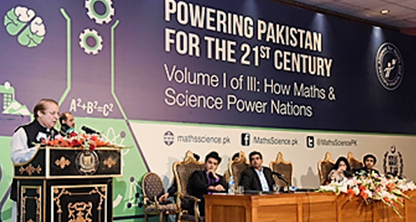 Volume II of “Powering Pakistan for the 21st Century” will offer a summary of the current situation of Maths and Science education in Pakistan, and is expected to contain stark data about the level of learning outcomes in Maths and Science across the country. Volume III will offer a roadmap for the future based on extensive consultations with scientists, mathematicians and academics in Pakistan and abroad.ITA is proud to be associated with this movementand it will strongly support upcoming report launches.